Mercy Ships is an international charity which operates the world’s largest civilian hospital ship, the Africa Mercy, providing free healthcare services to those living in developing countries, namely in Africa, where the services of professional medical staff are most needed. The ship is currently docked in Madagascar, which is one of the world’s poorest countries with only 2 physicians and 3 hospital beds available for every 10,000 people. Founded in 1978, Mercy Ships has worked in more than 70 countries providing services valued at more than $1 billion, impacting more than 2.42 million direct beneficiaries. Professionals including surgeons, dentists, nurses, health care trainers, teachers, cooks, seamen, engineers, and agriculturalists donate their time and skills to the effort. 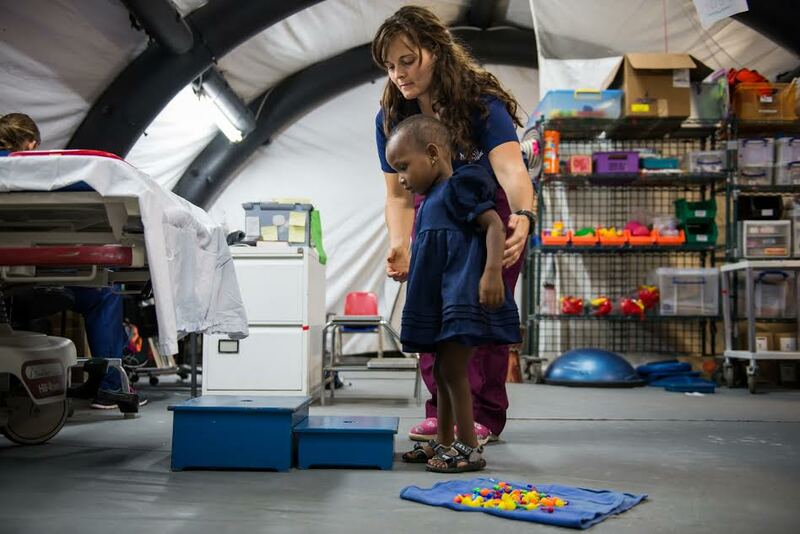 Mercy Ships seeks to transform individuals and serve nations one at a time. Here we meet three people who have been helped on these ships of hope. It seemed like a small thing, so Lalao paid scant attention to the small bump on her face. 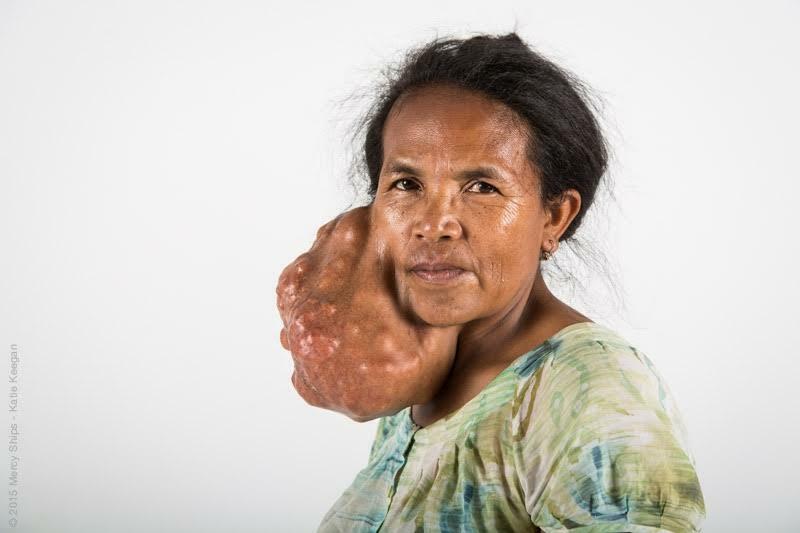 Instead of disappearing over time as she expected, the swelling on the Malagasy school teacher’s face grew and grew. 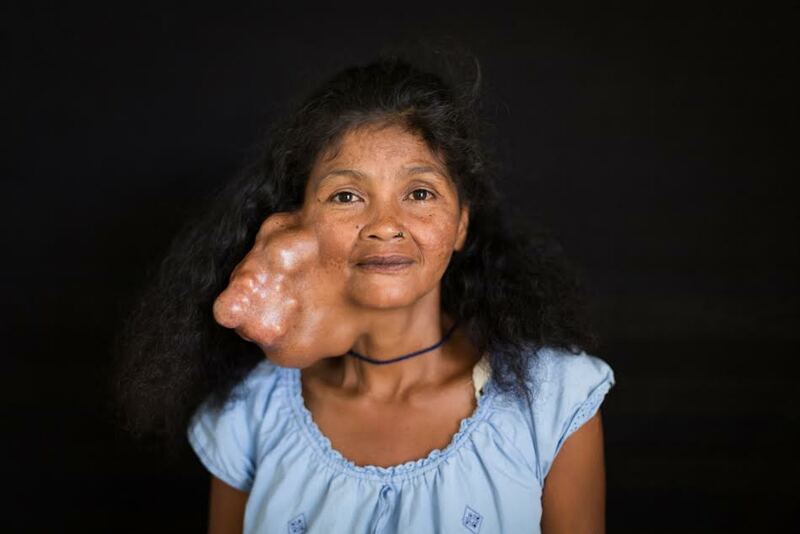 Over 14 years the benign tumor developed until it resembled a huge bag of marbles hanging from her cheek. The growth did not hurt, and amazingly her school children just ignored the strange sight. Lalao and her husband Albert are well-liked and respected by their small community, so people looked beyond her odd appearance. Lalo simply donned a scarf and continued to go about the village. The day came when Lalao’s burden prevented her from turning her head to the right. She was unable to sleep comfortably. She could no longer help in the garden to provide food for their family. So the 50-year-old began searching for help to eradicate the parotid tumor taking over her life. Lalao and Albert travelled to a city hospital and were assured Lalao was a candidate for surgery. They paid five years’ savings up front for the operation then went home to await the appointment. They waited and waited, finally returning to the facility only to be told it was no longer possible to perform the operation. The couple were not able to retrieve their payment, and were sent to another hospital. Again they paid 400,000 Ariary-ariary to be added to the surgical list. Again, the promised appointment never eventuated. Their finances were exhausted and Lalao was deeply discouraged. She gave up hope of ever finding help, but Albert was determined to keep looking. The couple were astonished when a sick baby from their village returned from the Mercy Ship with his tumor completely gone. 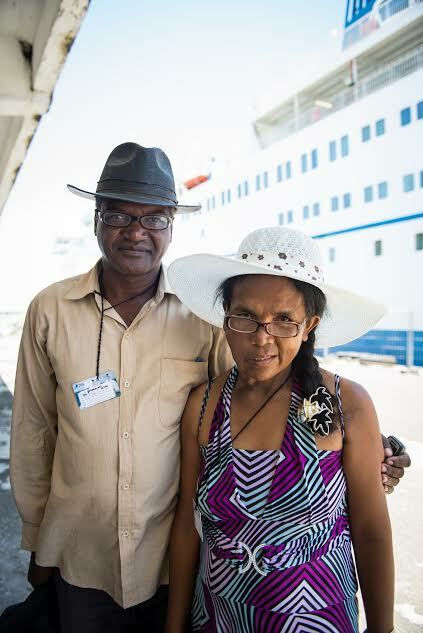 They watched a TV program about Mercy Ships and knew they had found their answer at last. So Lalao joined the line at three the next morning. It was cold in the mountains, and at least two hundred people were waiting before her. Eight hours later Lalao gave her medical history to the team. She was carefully examined and in 90 minutes she held the treasured appointment card in her hand. The sale of a precious pig paid for their transport to the Mercy Ship docked at the coast. After so many disappointments, hope and healing was finally at hand. Patricia had a whirlwind 24 hours where she was screened on the ship, admitted and then had surgery all inside of her first 24 hours on the ship. Patricia is a 45 year old mother of two and grandmother of three who has carried a facial tumour for the last 15 years. Her tumour began just below her right ear lobe and grew slowly to its current size. Upon removal, the tumour weighed in at about 900 grams (2 pounds). Just a few hours after surgery, Patricia shared that it was like waking up from a dream to see the tumour that she carried for so long gone. 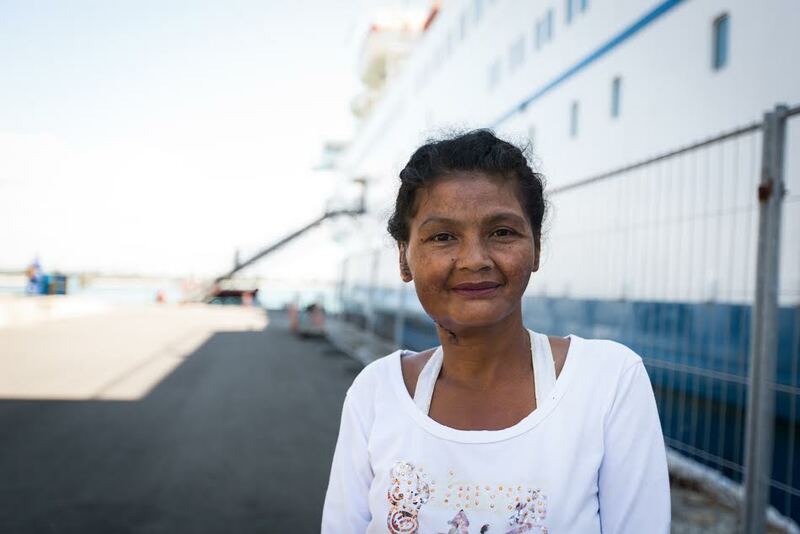 Patricia shared with the Mercy Ships medical team how at first she just noticed a bump underneath her right ear lobe. She went to the doctor when it began growing and he prescribed some pills to take. The pills had no effect and she didn’t return to the doctor for a long time. Five years ago she returned to the doctor, he evaluated Patricia and determined that she needed surgery – a surgery she couldn’t afford. Patricia shared that she is often stared at when she travels through the market or her village. She noted that if strangers ask her about her tumour she is not as bothered as when her family and friends ask her about it. She says that it has been difficult at times to respond to questions about her tumour. Many of the people in her village believed she had some sort of creature growing inside the tumour. When Patricia was told that she was being admitted for surgery she immediately called her pastor in her village to let them know that she was having surgery tomorrow and she excitedly shared that the ship was real and that she was finally going to be rid of her tumour! Patricia’s tumour was successfully removed by Dr. Mark Shrime (from the USA). She was smiling ahead of her surgery and those smiles continued afterward. In the evening after her surgery, Patricia was shown her face in a mirror for the first time. She said that it was like waking up from a dream, she couldn’t believe it. She thanked God and said that it was because of Him that this was all possible. Her surgery has been successful and you can just see the nice transformation she’s had. With such a petite face and the location of her tumour on the side of her face, it is easy to see the change. 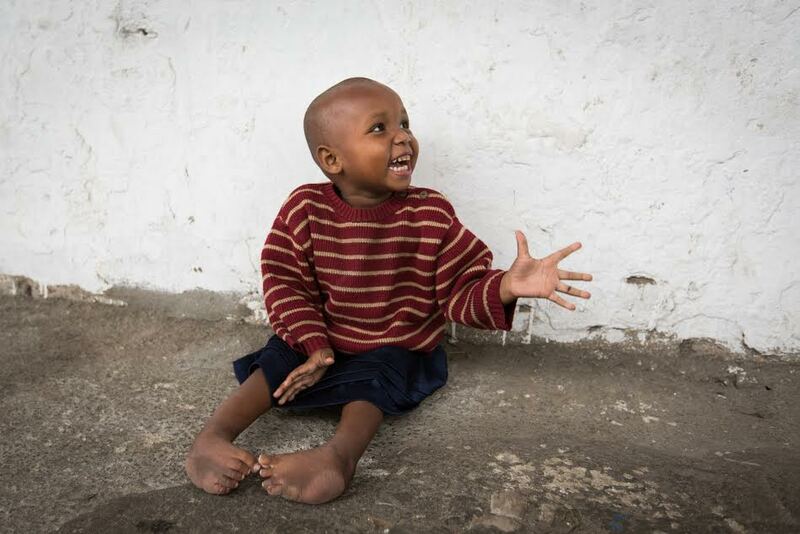 Cyriane is one of the happiest three-and-a-half year olds that one will ever meet. If she had to be described in a single word it would be joy. One would never know that she has faced incredible challenges with her infectious giggles and the way she throws her arms up to greet you. But Cyriane has double clubbed feet with her feet forming perfect “L’s.” She doesn’t allow her feet to slow her down but she would love to wear shoes and often models her older sister’s shoes on her hands. Cyriane was accompanied to the ship by her mother Emiliana. She shared that Cyriane was born with clubbed feet. However, she has very few limitations, she runs around with the boys in the village, plays soccer and is as active as any child. Her two biggest limitations are that she cannot stand without holding onto something for support and she cannot wear shoes. Emiliana shares that Cyriane will often wear flip flops on her hands so she can be just like her older sister. Although Cyriane is not in school yet, Emiliana was worried that as she got older the other children would tease her because of her feet. Ponseti casting in combination with the small tenotomy on each foot has seen Cyriane well on the way to straight feet and the correction went extremely well. Cyriane and her mother have a wonderful relationship. Emiliana is such a wonderful, caring and supportive mother. She was extremely supportive of the physio therapists in their efforts to correct her daughter’s feet and is a great distraction while Cyriane is being treated or the casts replaced. It was an exciting day when Cyriane came back to the ship to have her casts removed for the last time and she wore her best pink dress for the occasion. She was very excited to have her feet out of casts but was really disappointed when she was given the brace shoes to wear. Luckily Cyriane only had to wear the brace shoes for 12 to 14 hours at night until the age of 5, which is not too far off for her. Cyriane was so proud the day she returned to ship for the final time, she walked in with new sandals! She is still getting used to her new feet but the skin on the top and side of her feet is healing quite nicely and slowly but surely she is learning to step heel to toe. YOU JUST GOT TO LOVE IT!!!!! THERE IS NO DOUBT. IF I WERE YOUNGER I WOULD SPEND A YEAR WORKING IN SOME CAPACITY ON A MERCY SHIP. HOW CAN I GET A MERCY SHIP TEE SHIRT XXLARGE? I noticed there were shirts and other things at the Mercy Ships “catalog” web site (http://store.mercyships.org/) in the tab “Mercy Gear”. The catalog also has surgeries, etc. that donors can support.